Recently short-listed for this year’s Governor General’sAward for literature, The Juliet Stories is the most recent work by Carrie Snyder. This novel-in-stories spans the life of Juliet from the tender age of 10 to adulthood. The eldest of three children, Juliet is the daughter of naive left-wing parents who uproot their family from Indiana and go to Nicaragua to help the Sandinistas fight the Reagan-backed Contras in the early 1980s. The well-intentioned father, however, is much more interested in fighting alongside the Sandinistas in el campo than helping his wife and young family get acclimatized to the new language and culture. But Juliet’s father is not the only one with his focus elsewhere. Although her mother, Gloria, is busy with her family and chasing down a toddler, it appears that she would rather be strumming her guitar and showing off her beautiful singing voice at adult parties than being a mom. Gloria is quick to pass on some of her parenting responsibilities to the eldest Juliet, something that the daughter resents. The three children slowly adjust to their new life in Nicaragua, but Juliet is always an outsider at school, or the girl who has the unladylike habit of sweating and throwing like a boy in gym class. There is a constant stream of Roots for Justice volunteers arriving from the United States to continue the struggle, and her father gets a little too involved with a few. The family endures some harrowing experiences which include being stopped by a group of armed men in the hills and having their car stolen. This is around the time that the family discovers that Juliet’s brother Keith has cancer. The father stays behind to fight for the cause, while the rest of the family goes to live with the paternal grandmother in southwestern Ontario, where the brother undergoes treatment. Juliet is again an outcast at her new school, as she comes to terms with her brother’s illness and the fact that he is the exclusive focus of her mother’s attention. In the years that follow, the family disintegrates, and the parents move on to new partners. Fortunately, Juliet does not heap all her anger and blame onto her mother. The daughter is able to forgive her mother’s lack of attention when she discovers that she is pregnant after a one-night stand. Juliet learns from her aunt that she, too, was initially an unwanted pregnancy. Her father is more the target of Juliet’s wrath. After his death, the adult daughter wants to torch the farmhouse, the last place the entire family lived together. Carry Snyder is someone we’re bound to hear more of in the future. She is a writer's writer. Her razor-sharp prose is insightful and rich throughout, but the stories set in Nicaragua are by far the best. This is the perfect book for anyone who has lived or traveled in Latin America or who is simply curious about what it was like to have revolutionary parents in the early 1980s. This review was cross-posted at Rover Arts. 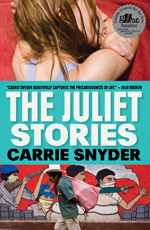 : Review of The Juliet Stories by Carrie SnyderTweet this!